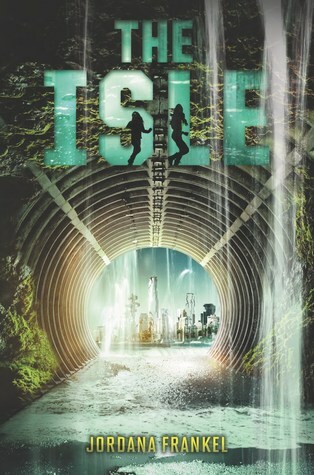 Welcome, welcome, to The Isle aka the next stop in the Harper Winter 2016 Blog Tour. This will come in handy later, but today's daily word (or safe word, whatever you'd like to call it) is: HAVE. Anywho, let's get the show started! 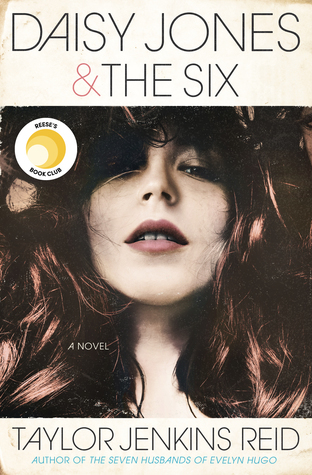 "The heart-racing and thrilling sequel to The Ward about a teenage female drag racer who will do anything to save her sister—and a flooded futuristic Manhattan. The Ward is in trouble—its streets filled with seawater after a devastating flood and its impoverished inhabitants suffering from a deadly disease called the Blight. Ren, with the help of her scientist friend, Callum, and her racing buddy, Derek, has discovered a cure—miraculous spring water—administering it to her sick sister, Aven. But when Aven is kidnapped by Governor Voss, the malevolent dictator of the United Metro Isles (UMI), Ren must go on a dangerous mission to save her sister, again. The mysterious healing water is the only source of freshwater throughout the entire UMI—water that Ren had been tasked by the government to discover. Although she refuses to give up the water’s location, Governor Voss has his own selfish reasons for wanting it. And he will do anything to satisfy his thirst for unquenchable power. But Ren and Aven have more enemies than the governor. An ancient order, the Tètai, has been guarding the magical water for hundreds of years. And they will kill to protect it. With the Ward in desperate need of freshwater and wracked by disease—and deadly enemies at every turn—the sisters face a dangerous journey, marred by mysterious secrets and horrifying truths, to save their friends and neighbors, and a city. " About the Author: Jordana Frankel is a Jersey native and does not enjoy nonsense in the least (please refer to exhibit A). She is fluent in procrastination, has a deep and abiding respect for dogwalkers, and was once fearful of fire. She pretends she is invisible from time to time, pretends she is visible from time to time, likes to spin things (fire, her wheels, stories, her keychain when poi are inappropriate), and she lies for a living, but can't lie to save her face. Etcetera, etcetera, she received her B.A. in English from Goucher College, graduated, ate lots of pasta, accumulated much laundry, and then went to live in Italy for a year. (You see, Jordana hoped to be an artiste someday. Le sigh.) But then she decided that poetry was more practical, what with poetry reality TV shows becoming all the rage, and those poetry dance clubs with the smarmy, handlebar moustached bouncers. Those guys are awesome. So she went for her MFA in Poetry at Hollins University. Naturally. But then she graduated, as all students must one day let go of the safe hands of academia, and she moved back to NYC. Which eats people. But hallelujah! She got her first big-girl job at The Literary Group International (bless their hearts for taking a chance on a poetry grad), a literary agency, where she'd started as an intern reading queries and then assisted editorially. At Linn Prentis Literary, also a literary agency, she handled foreign sales, picked up gems from unsolicited mail, and helped authors through the publishing process. And then it was onto The Book Report Network where she handled ads and promos for features on Teenreads.com, Kidsreads.com, and GraphicNovelReporter.com. Jordana's debut novel, THE WARD, (KT Books/HarperCollins) is in stores now. She hopes never to have to write in third person again. Giveaway and rules: There are actually TWO giveaways going on. Let's start with the first one. 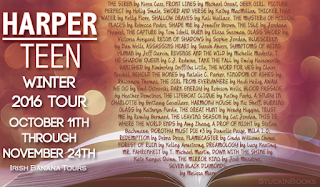 The crazy awesome people at Harper Teen are giving away a copy of each title on this tour. That's right, that's the entire Harper Teen Winter 2016 catalog which is well over 30 books (I lost count after 30). 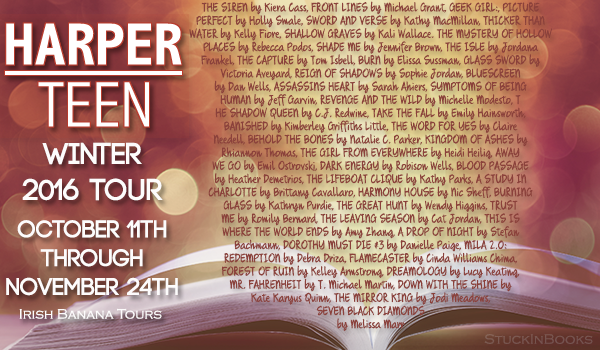 Be sure to check out all of the other stops (listed below) to see all of the other books coming out and what you can possibly win! How to enter: Simple fill out the Rafflecopter form listed below. The more authors you follow, the higher your chances are in winning. This book sounds interesting. I haven't read the first one so I might have to do that before really giving an opinion! I spent some minutes staring at the cover. Its stunning. Wow a lot of the Harper Collins tour has second books T.T I guess I've got a lot of reading to do!!! This book sounds really interesting! I will have to check out the first one! This tour has some really amazing looking books on it! Hmm this sounds very interesting. But I have yet to read the first book in this series. The cover is very pretty though!! That cover is just gorgeous!! I love it! I haven't read this series yet. But it sounds intriguing! Drought, drag racing and a kidnapped sister?! This books sounds fast paced and interesting!